Bring a medium pot of salted water to a boil. Stir in the rice; boil until just done, 10 to 15 minutes. Drain and transfer to a large bowl. Let the rice cool slightly and then stir in the yogurt. Meanwhile, in a large frying pan, heat the oil over moderate heat. Add the onions and cook, stirring occasionally, until translucent, about 5 minutes. Add the garlic, ginger, mustard, cumin, cayenne, coriander, cloves, and 13/4 teaspoons of the salt and cook, stirring, for 1 minute. 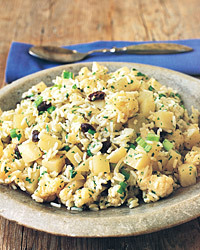 Stir in the cauliflower, potatoes, and raisins and coat with the spices. Add 2 tablespoons of the vinegar and the water and bring to a boil. Reduce the heat and simmer, covered, until the potatoes are almost tender, about 10 minutes. Uncover, raise the heat, and simmer until almost no liquid remains in the pan, about 10 minutes more. Add the cauliflower mixture to the rice. Stir in the remaining 1/4 teaspoon of salt, 1 tablespoon vinegar, the cilantro, and scallions. Taste the salad and, if necessary, add the remaining 1 tablespoon vinegar. Basmati's spice and jasmine aromas suggest a floral Vouvray from France's Loire Valley. You'll need a demi-sec to stand up to the spices here.